Have you intentionally managed and optimized your sales lead routing and assignment process? If not, you could be leaking sales, marketing ROI and not realize it. LeadData’s new report, The State of Lead Management, based on a survey of 527 B2B sellers and marketers found an average 25.5 % of marketing-generated leads get assigned to the wrong account owner. Did you catch that? Over 25% of marketing-generated leads get assigned to the wrong person. This means individuals who expressed interest are not getting the attention they deserve. LeanData also discovered sales and marketing leaders also have different opinions on lead follow-up effectiveness. 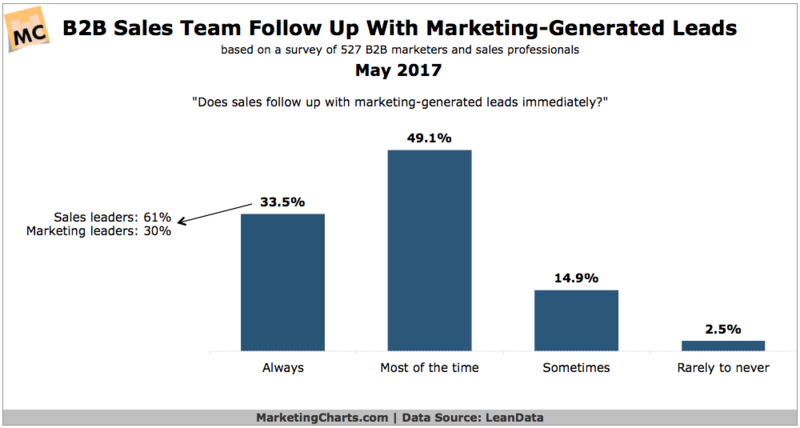 For example, the chart below shows 30% of marketing leaders believe that sales will always follow-up on marketing-generated leads compared to 61% of sales leaders. In this post, I’m going to share seven tips to help you improve lead routing for more sales. Do you have the following things documented with your sales team? Management support to help keep sales team accountable? Clear process flow from form completion to sales hand-off? I helped a client develop a service level agreement to improve lead routing and increased their leads-to-opportunities by over 200%. Developed a universal lead definition which influenced how they score leads. And field sales agreed to engage all marketing-qualified leads within 24 hours. Qualified all leads with inside sales and distributed within two business hours. Used a checklist to update territories often to keep up with changes. 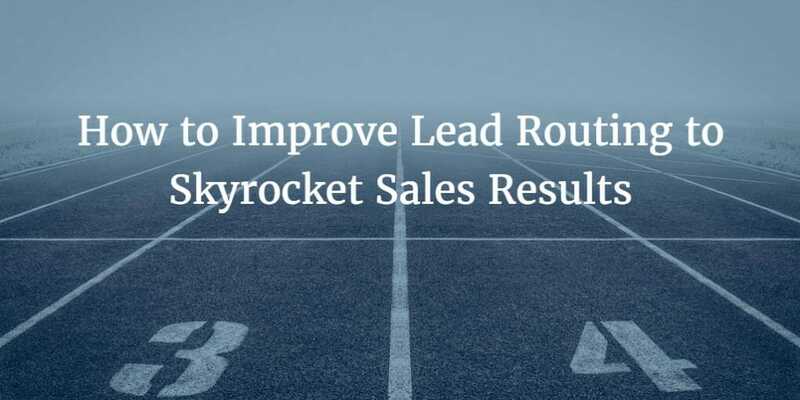 Routed leads via automated rules in Salesforce.com. The workflow notifies the salesperson and creates a task with a deadline. Setup rule if a qualified lead is not opened/edited by the assigned rep within 24 hours, they get a reminder message from their manager. And if a sales lead goes more than 48 hours, they get a call to see if that contact needs to reassigned or if they need help. It takes some time to plan the process and collaborative work with sales. But it’s worth it. Using this approach, they converted 200% more leads to opportunities. Use your potential customer’s and your sales rep’s time well. When someone downloads a single piece of content (like a white paper), are they ready for a sales rep to call? Not likely. The key to lead routing to match readiness of the lead (i.e., future customer) with expectations of your sales team. If you don’t do this, you’re starting them off with an immediate disconnect. First, you need to qualify each lead to see they are “sales-ready” which means they want to talk to a salesperson. You can find this ideal point by using lead scoring and lead qualification. There is only so much information that you can get off a Web form or that someone will volunteer in an email. For more, read: Lead Qualification: Stop generating leads and start generating revenue. Like a relay race, there’s a point when Marketing’s and Sales’ hands are on the baton when you make a handoff. You need to be clear when marketing is going to hand the lead off to sales. You need to be clear when marketing is going to hand the lead off to sales. So don’t drop the baton because that hurts the relationship. Without your input, sales people can resort to boring or irrelevant messaging. This is not because they lack creatively, it comes down to their time. Help your salespeople spend their time connecting and selling rather than building content and messaging. Create a few emails and some talking points to help them connect with the motivation of leads based on their interest. In sum, help your sales team with messaging and content to engage relevantly. Use lead grading to rank what level of expertise leads need based on the need. More general inquiries can go to inside sales reps first. Do not frustrate field salespeople with sending them people who don’t want to talk to them. Make sure you sort your leads based on anticipated needs or interest then route them as soon as possible. Use your sales team’s industry experience and knowledge. The more you know about your reps, the more you can match with leads they’ll have the most success. This is why round-robin lead distribution can be deadly to conversion. It assumes every salesperson is the same. If you have a large distributed field team, you likely route leads via territories or regions. But smaller teams and inside sales teams can also use local lead routing too. You can help your help your sales team make local connections. For example, if a contact works from home in CA, but their office is located in MN. Who do you route this lead too? Can that person based in CA connect work with someone local? You need to real collaboration with sales to do this. Airline pilots, portfolio managers, surgeons use checklists so why not marketers? By using lists, you can improve your performance and get more consistent results. For more on this, read HBR: Using Checklists to Prevent Failure. In sum, you can get a boost to your lead generation ROI without any extra spending by improving how you route leads. Using the example I started with, if you were to improve lead routing, it’s like getting a 25% lift in leads. Here’s this best part: You can do this without spending anymore more budget. That’s the kind of results we can all get excited about. It’s your turn. What’s worked for you to optimize lead routing? Share in the comments below.